Honda’s luxury vehicle brand, Acura, is being promoted with an integrated campaign leveraging on the powerful, bold and fluid lines and energy of the completely redesigned TL 2009 to attract consumers to the Acura brand. The Acura TL is already ranked as the second best-selling luxury sedan in the United States behind the BMW 3 Series. A fully integrated national advertising campaign for the all-new 2009 Acura TL performance luxury sedan began on September 22, as the largest, most integrated Acura launch to date. 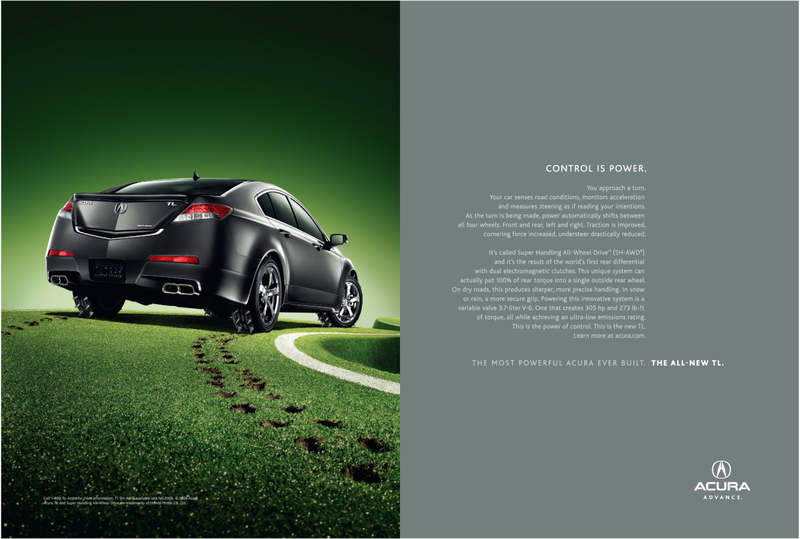 The campaign’s theme, “The most powerful Acura ever built,” is represented throughout the multi-platform campaign. While power is most commonly used in relation to engine output, every part of the all-new TL has been engineered to be worthy of this adjective and is consequently integrated throughout the campaign. The first three television commercials in the campaign, using slow motion cinematography, were launched on September 22. A slow motion fist smashes through a plank of wood, demonstrating the force, “Strength is power,” of the all-new TL. Stunt by Rene Mousseux at RPM Stunts. A bullet fired through a bottle showcases the accuracy and exact nature, “Precision is power,” of the redesigned TL. Holly Palmer and Heather Alden. A slow motion spiraling diver, Brian Earley, introduces the beauty and elegance, “Grace is power,” of the TL. The Acura TL campaign is being rolled out by RPA, Santa Monica, by creative director John Hage, senior art director Eric Goldstein, copywriter Grant Holland, agency executive producer Jack Epsteen, interactive copywriters Keith Wisniewski and Jeff Mullen, interactive designer John Waters, print photographer Andy Glass. Filming was shot by director Nicolai Fuglsig via MJZ, Los Angeles, with director of photography Barry Peterson, executive producer Eric Stern and line producer Emma Wilcockson. Editor was Robert Duffy at Spotwelders. Visual effects and telecine were developed at The Mill by VFX creative director Angus Kneale, CG supervisor Ben Smith, VFX producer Dan Roberts, colorist Fergus McCall. Audio post production was mixed by Bob Gremore at Juice, Santa Monica. Music was composed by Douglas Darnell (Fist and Bullet) and Michael Schanzlin (Dive) at Robot Repair. Sound was designed at Robot Repair. Voiceover is by James Spader.